I had no idea what I was going to make for dinner until I got into the grocery store and started looking for ideas. I found a beautiful big savoy cabbage which is my favourite cabbage for making cabbage rolls. The only other ingredient I needed to pick up was lean ground pork. 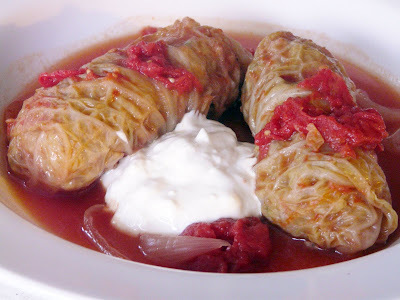 My favourite cabbage rolls are filled with rice and pork, seasoned with onions, garlic, parsley and rosemary or thyme. And, I like them baked in chicken broth with tomatoes, onions and garlic. I don't like them in a thick tomato or ketchup sauce. Normally I would have made something like mashed potatoes and another vegetable to serve with them, but Moe was happy with just the cabbage rolls served with a little sour cream on the side. 3/4 cup to 1 cup of raw rice, Cooked until almost tender. Bring some water to boil in a large pot. Add the cabbage and steam for 10 minutes to soften leaves. Remove leaves and return cabbage to pot if needed. Continue removing leaves. Saute onion until soft and add chopped garlic, and parsley. Mix the ground pork with the rice, onions, garlic and parsley,, season with salt and pepper and herbs. Fry a small piece to test for seasoning. Adjust seasoning if needed..
Cut onions into slices and place in bottom om covered roasting pan. Add some cracked garlic cloves. Add 2 cups of chicken broth and one can of tomatoes coarsely chopped. Place cabbage rolls on top of onion mixture and cover tightly. I cover with foil and then the lid. Bake in oven until cooked approximately 1 1/2 hours at 350° to 375°. Serve with some of the juices from the pan and some sour cream. zest and season with salt and pepper. Form the cabbage rolls and place in a deep oven proof casserole. 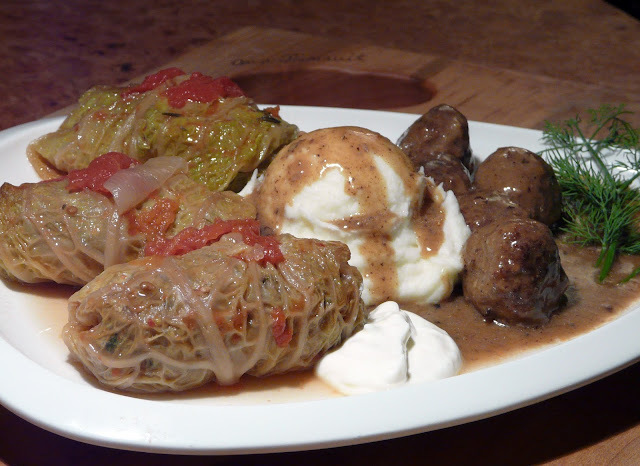 I am Polish and I grew up on cabbage rolls. 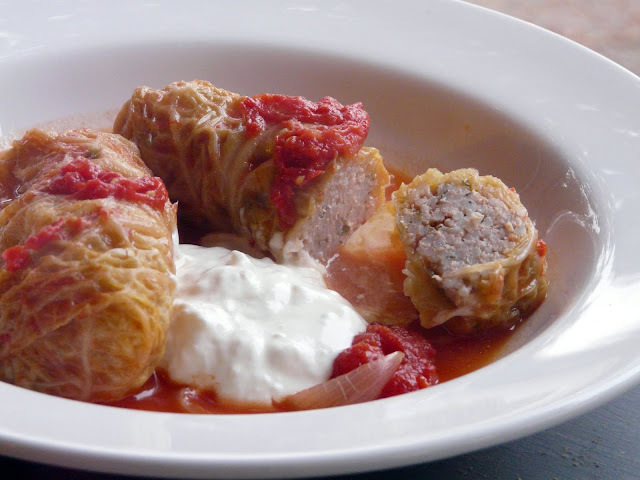 My one grandmother used to make the best cabbage rolls and the other the best pierogi. I will never be able to replicate theirs... These took me back to many sweet memories!! 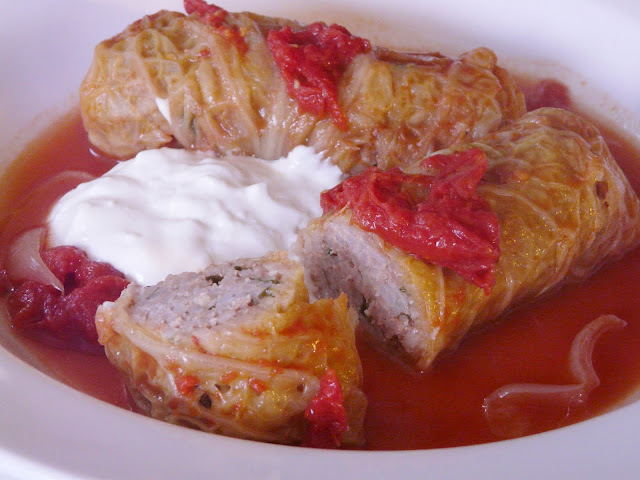 I have been craving stuffed cabbage and I am going to have to try your recipe because I know it will be fabulous! Oh you just made me soooooo hungry! Ann..I haven't made these in AGES.. I can almost taste them, Ann! You & I both make them the same way EXCEPT for one thing. I use a big can of V-8 juice instead of the tomatoes. It really ups the flavor, IMHO. I have another recipe for using these same ingredients only they are all layered in a pan rather than rolled. 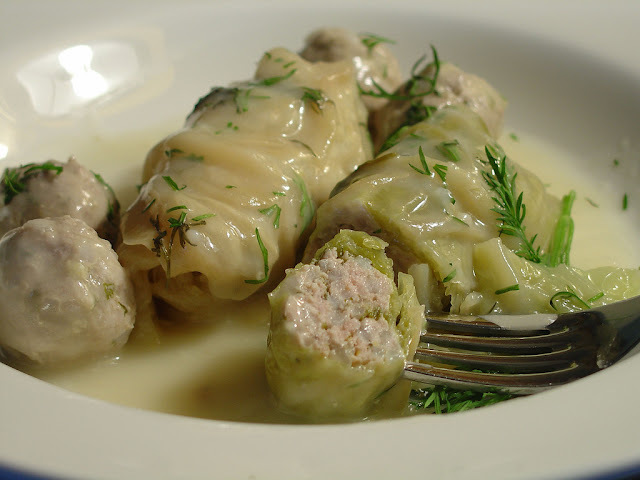 Called "Lazy Cabbage Rolls". I'll have to do a post with that recipe soon. Lots of cabbage out now because of St. Patrick's day coming. Well, I have never seen more attractive cabbage rolls in my life! I think I'm doing this instead of Corned beef for Paddy's day.. great recipe!! Ann, I'll confess I've never made cabbage rolls. Partly due to the fact that my DM was a whiz in the kitchen, and made this dish often. So I never even considered replicating it. But, looking back on it now, and looking at your mouthwatering photos makes me wish I had, at least, given it a try. Great photos, now I want to eat some!